How do I insert the Online Shop in my Website Builder site? You can insert your Webshop in your Website Builder site with the Webshop component. 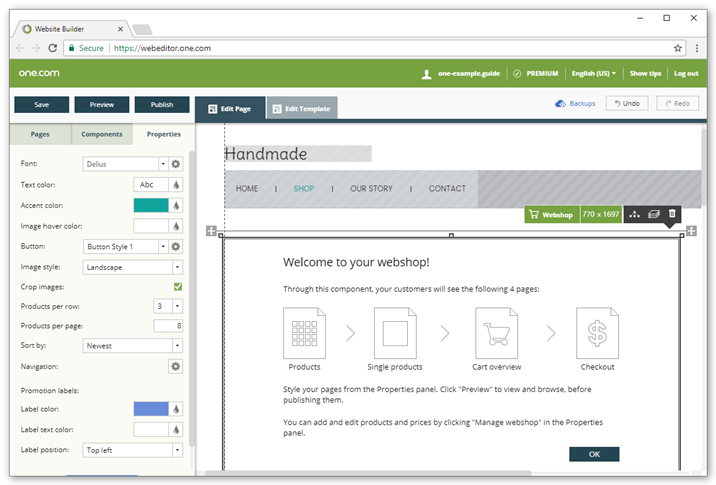 Go to the Components tab and drag the Webshop component into your work space. Adjust the Properties of the webshop. Font - The font type that is used in your shop for all text. By default the font that is set for Heading 2 is selected. Text color - The color of all text in your shop, except prices, buttons and labels. Accent color - The color of the prices and shopping cart icon. Image hover color - The color that becomes visible when you hover over an image. Button - The design of your buttons: colors, corners, font, border. Image style - The orientation of your image: square, landscape, portrait, actual ratio. Crop images - Whether you want to crop all images to have the same size. Products per row - The amount of products per row, select 2-8. Products per page - The amount of products that are first loaded on your page. A button to load more images will be visible if there are more products to show. Sort by - How your products should be sorted by default: alphabetical, newest, price, most popular. Navigation - Select what selectors should be visible in your shop: category and/or sort by selector. Label color - The color of the promotion label that is shown on your product, if you selected this in the Webshop administration. Label text color - The color of the text in the promotion label. Label position - The position of the promotion label on your product image.